This practical resource provides an original multi-element approach leading to planned individual interventions. Drawn from the author's extensive knowledge of autism it enables those living and working with children with Autism Spectrum Disorders (ASD) to jointly plan for change. 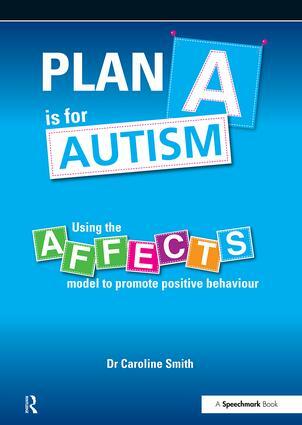 help you to implement a unique and individual intervention plan for the child with autism using the AFFECTS plan. "This is a useful resource in that it provides a succinct yet wide range of guidance and management tools for working with people who have an autistic spectrum disorder (ASD). A book and a CD are provided, with the CD including many of the key resources and frameworks discussed in the book. It is evident that the author builds on many years of experience as an Educational Psychologist working with children and young people with autism and their families within a school setting. One of her core beliefs is highlighted early on: "if the child could act more appropriately they would. The child is not being deliberately difficult". This book would be a useful one for professionals working with children and young people to assist in understanding their behaviour and communication and working with others to develop comprehensive intervention plans whilst acknowledging the importance of on-going evaluation and review. What’s autism got to do with it?